Welcome to Fire and Light Gallery! The gallery is located at 509 E. Ridgeway St, in Clifton Forge in the heart of Clifton Forge. Our regular hours of operation are: Wed-Sat, Noon-5pm & Sun, 12-3. We'll also open the gallery whenever we're working or for scheduled appointments. Portrait sittings and other shooting can be scheduled at any time during the week including weekends and evenings. Just call to set up a time. Gift Certificates are available and cover products, portrait sessions, and workshops. It's a perfect gift when you're not sure what to get. Just click on the GALLERY link and then click on GIFT CERTIFICATES for pricing or to order. 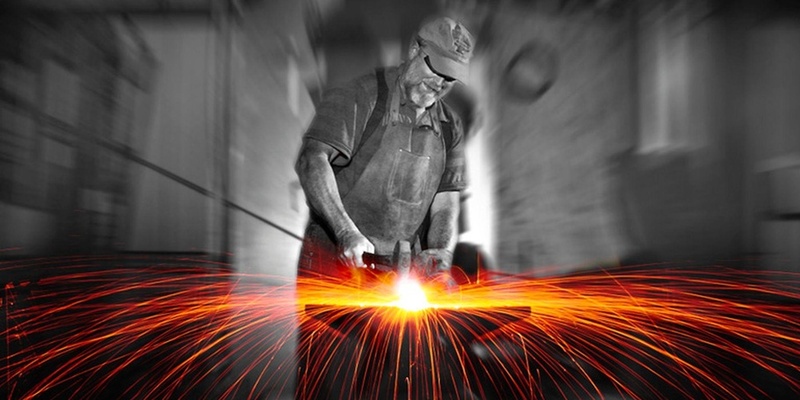 Fire and Light is a gallery highlighting the blacksmith work of Glen Bryant and the photography of Chuck Almarez. During the day, we run a herd of Boer Goats, Angus-Gelbvieh cattle, and a bunch of horses on Lost River Farm in Iron Gate, VA. After hours (and in our spare time) Glen beats iron on his forge and Chuck spends too much time taking pictures in and around the Alleghany Highlands and operating Kid Pix Photography in Clifton Forge. The work on this site represents some of those lost hours. To find out more about each of us go to the Menu and click on Blacksmithing or Photography. You can navigate around this website by using the buttons at the upper left. Click on "Sign In" if you would like to create a personalized "Light Box" where you can store up to 100 of your favorite images. Roll over the "Gallery" link and you'll see a set of Folders. Roll over a Folder and the image galleries nested in each one will appear. Click on an Image Gallery to view the images inside. Roll over the "Menu" link and click on Home to return to the Home Page, click on Contact to send us an email, or click on Blacksmithing or Photography to find out more about Glen and Chuck. At the bottom right of each page is a "Search" box. Enter a key word to search for specific images. You might enter "candle holder" to view those images, or "Clifton Forge" to see all images of Clifton Forge. When you go into an image gallery a set of thumbnail images appear on the page. Check the top of the page to see the total number of images in the gallery. You may need to click on the page numbers at the upper right to see the next set of images. Roll over any thumbnail and a larger version will pop up. Click anywhere on the thumbnail to open the Full Screen view. Click on the small Grid Icon at the bottom of each image to add the image to your Lightbox. To purchase an item, click on the image thumbnail to get to the Full Screen View. Click on the "View Option and Prices" link to make your selection. You may see a "Get a Price Quote" link on some items. This will open a form that will let you request a price or submit an inquiry. Click on the 'X' at the top right corner of the page to return to the thumbnail view. In the Full Screen view you can see the name of the image, navigate to the next or the previous image, view the gallery images in a slide show (and change the speed of the show), or add the image to your lightbox. You can also see the 'keywords' or Related Links that are assigned to this image as well as any Captions that we've added. Finally, at the top right of the screen is a View/Add Comments link that will let you provide us feedback and read what others have said. Thanks for visiting Fire and Light Gallery! Check back often for updates.